Description: BNSF 4758 with BNSF 4761 at Raton in November 1998. Still fairly clean after 6 months of work. Description: BNSF 4761 in the Raton New Mexico yard in 1998. The 4761 was about 6 months old. Description: BNSF 4761 Eastbound Arkansas river bridge Tulsa Ok. Description: A BNSF manifest sits at Mykawa with a A-B-A lash-up. Description: A northbound BNSF manifest waits on BNSF's Mykawa Sub. Description: Manifest Q380 with BNSF 4761 at sunset. Title: bnsf hammers east with green for west. 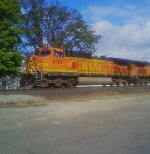 Title: 090803036 Eastbound BNSF SEMBIR taconite loads pass the CP Scrap Job at CTC Newport Jct. Title: 090803039 Eastbound BNSF SEMBIR taconite loads pass the CP Scrap Job at CTC Newport Jct. Description: Crossing from Main 1 to Main 2. Description: This is what Kansas City Railroading is all about. A BNSF intermodal rolls east off the KCT Santa Fe Jct. Flyover as UP Train IBPCI 10 goes west on the KCT High Line above a northbound BNSF empty coal train occupying the BN Jct. Plant. 3 moving trains in 1 shot! Description: Look, Kum & Go is still hiring. Description: Crossing into New Jersey, NS Train 502 coal loads bound for the coal-fired generating station owned and operated by Reliant Energy in Portland, PA, pulls through the ex-L&HR Hudson Yard in Phillipsburg and next to River Road, 1310 hours. The train will then back into the yard, cut half of the cars and leave them behind, and take the other half across the Delaware River at Martins Creek and approximately 15 miles north back into Pennsylvania and on to Partland, PA. Description: BNSF 4761 leads Norfolk Southern westbound train 135 with 90 cars enters Biltmore just before pulling into the Asheville yard.